The Nexus 7 is a great size for an electronic(ebook) reader. The width of the 7 inch screen makes it comfortable for holding it in one hand for reading books, magazines or comics and to complete the experience, you need some great apps for reading. Here are some of the top apps for the Google Nexus 7 to enhance the reading experience! In the Play Market, the biggest two are the Amazon Kindle app and the Barnes and Noble Nook App. These applications are generally better for buying books than actually loading your own collection and reading them. Instead, I currently use Mantano and Fabrik Reader and slowly being swayed over to Fabrik. Fabrik Reader is free of charge. It looks beautiful and has a well designed interface. Also, it automatically searches for book cover art. The best thing about it? Dropbox Synchronization. You can sync your books and reading progress as well, so you can read from your Galaxy Note 2 to your Nexus 7 and they will always be kept in sync. It has support for epub and mobi (which is Kindle format). Too bad it doesn’t support DRM and that’s why I am keeping Mantano, for me to read my free library books. Mantano comes in two versions, premium and free, with the free version supported by ads. It supports PDF, albeit slow in rendering them (I will mention a better PDF reader later). It supports Adobe DRM files, so it handles well with Overdrive library books. Typically, magazines come in PDF format or in their specially provided application, like the Time Magazine App. You can also buy subscriptions from Google Play Magazines. However, due to region issues, it is quite a hassle to use Google Magazines. If you have magazines in PDF format, a great reader that I use is Repligo PDF Reader. It is insanely fast. It renders PDFs quickly and the tap to zoom in or to zoom out works great. I have tried other PDF readers like ezPDF or Adobe or Mantano too, but none could match Repligo in terms of speed. It cost US$1.99 from the app store. Two apps for the different genre of comic books. The westernised comic books often come in CBR format and the best reader here is Komik. It has support for CBR, CBZ, and image directories. It has a clean and simple design, and generally good to use. The great thing about it over its competitors is that has a strong support of CBR and CBZ which the rest may have problems unarchiving them. For Japanese Manga, the go to app is Mango. I’ve used this app for sometime and am very happy with it. It’s a great app for reading online manga and supports quite a number of the popular manga websites. You can indicate your favourite manga as well and the app will notify you when new chapters are available. There’s support for offline reading too, perfect for the Nexus 7 which is WiFi only. Oh, did I mention, it’s also free? The Nexus 7 is also a comfortable size to read web-pages and here are some apps we use for websites and RSS feeds. 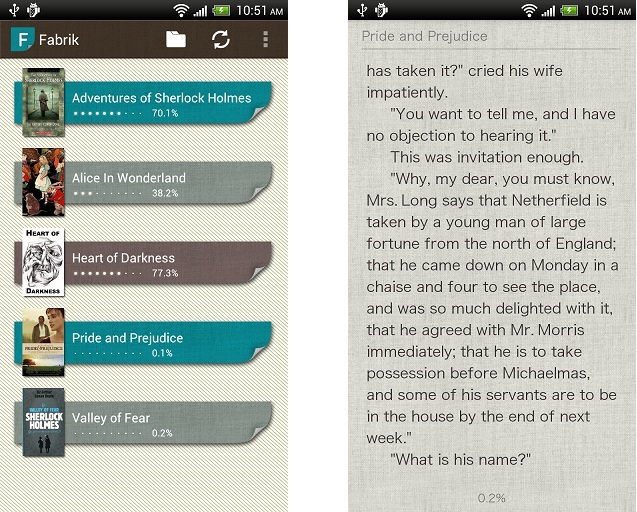 Pocket allows you to easily download webpages for offline reading. It’s fantastic, it makes reading long articles on the Internet fun again. There’s a whole host of editorial content you’ll find throughout the web, and Pocket strips out all of that website hassle and gives you the text, in a number of fonts and display styles. It’s an easy to download webpages and to read them later. For RSS feeds, and some of the specific linked websites,Google Currents offer a variety of free online material, packaged in a mobile friendly application. It has a nice interface that resembles a magazine layout and its quick and easy to find articles. Another similar alternative is Flipboard but I prefer Currents’ interface and easier access to articles. We hope you like our top lists of reading apps for the Nexus 7 or other Android tablets. Do share with us if you have any recommendations too, we would love to hear from you!